Please take full responsibility for your own health and wellbeing. You must read and agree to the following information before tapping with any TrulyMadlyDeeply Happy Program, Tapping Scripts, Videos or any other material presented on this website/program. The information I provide at TrulyMadlyDeeply Happy, including ideas, suggestions, techniques and other materials, including Tapping Scripts & Videos is intended to educate, inspire and assist you to lead a happy and healthy life. It is not intended to replace care that is best provided by a qualified health professional and is not intended as medical or psychological advice, diagnosis, or treatment. It should not be used as a substitute for any treatment that has been prescribed or recommended by your doctor or other professional advice of any kind of nature. Whereas EFT has produced remarkable clinical results, it has yet to be fully researched by the Western academic, medical, and psychological communities and therefore, is considered experimental. Neither Gary Craig, the founder of EFT, nor Julie Zommers are licensed health practitioners, and certain issues should be addressed by such professionals. Julie Zommers strongly advises that you seek professional advice as appropriate before making any health decision. 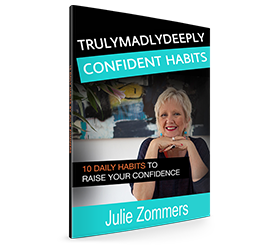 Julie Zommers accepts no responsibility or liability whatsoever for the use or misuse of the information contained within the TrulyMadlyDeeply Happy Program. You agree to fully release, indemnify, and hold harmless, Julie Zommers, from any claim or liability whatsoever and for any damage or injury, personal, financial, emotional, psychological or otherwise, which you may incur arising at any time out of or in relation to your use of the information presented in the TrulyMadlyDeeply Happy Program. *EFT and Emotional Freedom Techniques are registered trademarks of Gary Craig, and are used here with permission. I read this article and found it very interesting, thought it might be something for you. The article is called Disclaimer and is located at https://trulymadlydeeplyhappy.com/disclaimer/.